Checking oil and tyres | What Car? These are two fundamentals you should check before embarking on any journey. This often feels like too obvious a thing to mention, but making sure they're okay will save you money, and could save your life, too. First, look in your handbook and see what pressure your tyres should be with family and luggage on board (it will be higher than usual to cope with the extra weight). When you're checking the pressures, it's best not to rely on the gauges attached to pumps at a petrol station - they've been slung around by many a motorist and aren't necessarily reliable. Instead, spend a few quid on a gauge from an accessories shop and use that to check that you've topped up the tyres up to their recommended pressure. While you're at it, get a tread depth indicator as well. The legal minimum is 1.6mm across two thirds of the width of the tyre, but we'd highly recommend replacing any tyre that's getting on for having only 3mm of tread left. 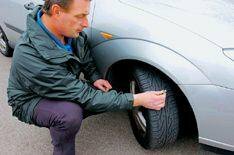 Remember to replace your tyres in pairs or in fours. Your car needs oil to lubricate the engine, removing all of the nasty bits such as metal fragments and keeping it running smoothly. Remember to check your oil level when the car's cold - not after it's been running and the engine is hot. Park on level ground, get a couple of bits of tissue and pull out your dipstick (if you don't know where this is, look in your handbook). Wipe the dipstick clean, reinsert it and pull it out again to get an accurate reading. Then, if necessary, top the oil up, but be careful not to overfill it as this can cause damage to some expensive components such as catalytic converters. Also, ensure you use the right 'weight' (viscosity) of oil for you car (5W/30, for instance). Details will be in your handbook, but you can also check online with many car or oil manufacturers to find out which you should be using.